How England’s Royal Society was born from, and continued to foster, the groundbreaking innovations of scientists. “The revolution in science was . . . not the work of one man, but of a Fellowship,” writes Gribbin (The Scientists, 2003, etc. ), seeking to spread praise more widely for the breakthrough usually attributed to Isaac Newton. In 1600, William Gilbert, an Elizabethan physician, published the first careful investigation of magnetism, with conclusions firmly based in experiments that Gilbert himself performed and described for the reader. Another Elizabethan doctor, William Harvey, used experimental techniques to trace the circulation of blood. Around the same time, Sir Francis Bacon laid a philosophical foundation for the scientific method. Bacon’s emphasis on experiment and on the practical value of scientific investigations inspired a group of men who began meeting at Oxford in the 1650s to discuss scientific questions. The group included several who would go on to make their marks in science, but one stood out: Robert Hooke, perhaps the last true scientific polymath. When the Oxford group evolved into the Royal Society in 1660, Hooke became the leading light of British science. 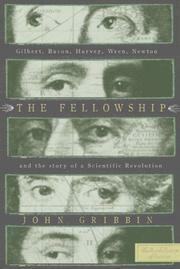 In fact, Gribbin argues, Hooke clearly anticipated several of Newton’s chief discoveries; only his low social status and less-developed mathematical skill kept him from being granted equal stature with his rival. Newton, for his part, did his best to keep Hooke in the shadows, going so far as to lose the only known portrait of his competitor when he supervised the relocation of the Society to new quarters in 1710. Gribbin concludes the narrative with Edmund Halley, probably the finest astronomer of his era. Halley encouraged Newton to publish, and his 1705 prediction of the return of the comet now named for him demonstrated the accuracy and universality of Newtonian theories. Full of interesting detail and anecdotage, a warm and readable history of a key era in science.